Xperia Z is one of the best devices introduced by Sony till date. This device has considerably helped in putting Sony on the map. The slick design of the phone combined with an awesome display and high durability definitely makes it stand out in the crowd. On the other hand, LG Optimus G Pro isn't less capable. This device also has a superb display, powerful processor and boasts to have many high end features. Following is a brief comparison of these two great devices. Xperia Z boasts of a very fashionable and high end piece of design with lustrous back and accented edges. The reinforced Dragontrail glass on both the sides provides a premium feel to the gadget. The device weighs just 146 grams, making it pretty handy. Optimus G Pro isn't as impressive in looks as it should be. The narrow and virtually non-existent bezel doesn't sync with the rest of the body of the device. Also, at 172 grams it’s much heavier than Xperia Z. Both these devices have got Android OS version 4.1.2 (Jelly Bean) installed in them, however the Qualcomm 600 processor and Quad-core 1.7 GHz Krait of Optimus G Pro is far superior to the Quad-core 1.5 GHz Krait of Xperia Z. The strong hardware provides a much better power to the Optimus G thereby offering greater future proofing of the unreleased apps as well as other content. As far as the storage is concerned, LG Optimus G Pro is a clear winner having 32 GB internal memory that can be readily expanded to up to 64 GB using a microSD card. On the other hand, Xperia Z’s internal memory is limited to 16 GB only which the user can extend to 32 GB using microSD. The camera of both these great gadgets is almost same and is based on 13 MP Exmore RS CMOS BSI sensor having auto focus and dual LED flash. Even the front camera is almost similar. Also, using these devices you can record HD videos at 1080p@30fps. However, a closer look of the detailing of images will reveal that picture quality is slightly better in Optimus G Pro, however the difference is minute. Picture quality in Optimus G Pro is surely good and being IPS+ it is expected to be a clear winner as far as display is concerned. However, high pixel density of Sony Xperia Z along with Bravia Engine’s 2 enhancement has made Xperia Z lead Optimus G Pro in this front. The screen size of Xperia Z is 0.5 inch smaller than G Pro; however, there is not match to the Sony’s display technology. Every smartphone users wants his device to last longer on a single charge. Being powerful phones both of these devices have got high capacity batteries with Optimus G Pro having a bigger 3140 mAh Li-ion battery as compared to 2330 mAh Li-ion battery of Xperia Z. The former provides you with approximately 598 hours of standby time and 31 hours of talk time, whereas the latter provides you with around 550 hours of standby time and 12 hours of talk time. 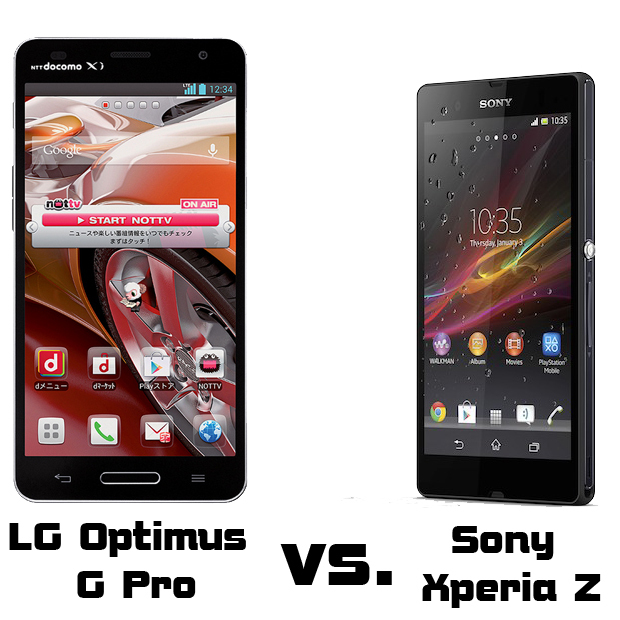 It will be difficult to say that which out of these devices are better than the other as both of them have got various advantages over each other and thus your selection will largely depend upon your preference.To save money on these great gadgets, you should look out for LG Optimus G Pro and Sony Xperia Z contract price deals being offered by various service providers. Anzer Khan is a professional article writer and specializes in writing articles on web designing and mobile phones. He is a technology lover and loves to read books and listen to music.